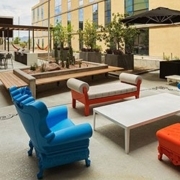 Want your own private space free of unpleasant views and irritating traffic and neighbor noise? Or perhaps you’d like to section off a large room or outdoor area for multiple uses, or find a decorative backdrop for your trade show or special event? 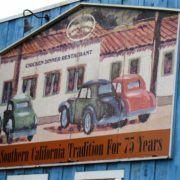 Our variety of indoor and outdoor privacy screens and space dividers answer to these common concerns and many more. The following three space dividers are some of our most popular, as they blur the line between functional and ornamental, instantly making your home, office, restaurant, or venue a more usable and beautiful space. Create your own space instantly and without hassle with our elegantly designed rolling trellises. These mobile garden trellises can be used as indoor or outdoor privacy screens, effortlessly rolled into place for use and then easily rolled back into storage when done. The sturdy construct of these rolling trellises is due to the fact that they are made of commercial-grade PVC materials, which makes them durable and yet lightweight for transporting to trade shows and special events without incident. 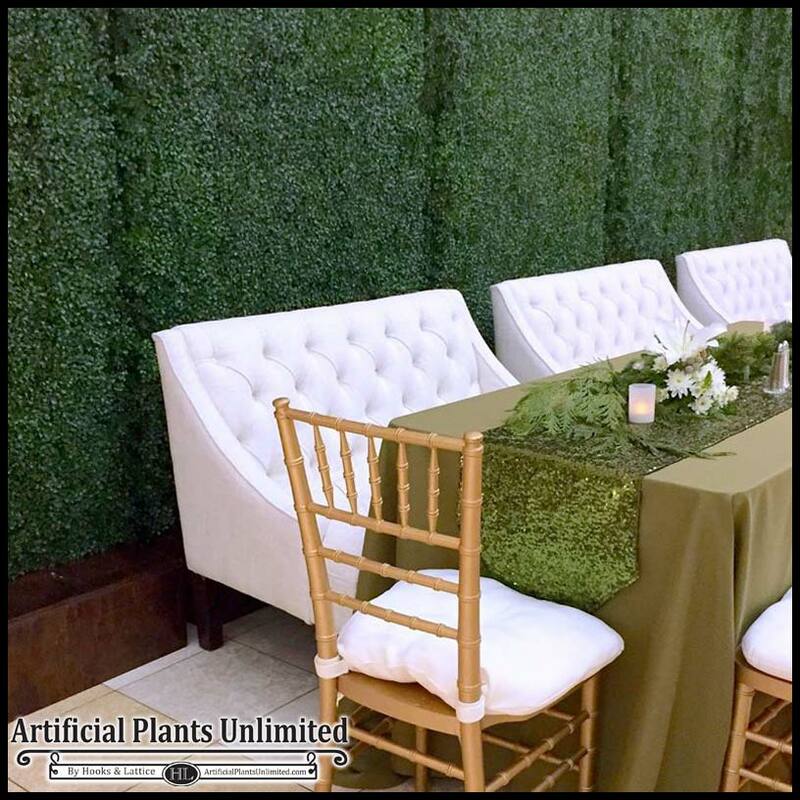 Artificial azalea vines are an option for our rolling trellises, or you can use live plants to accent the simple beauty of these indoor and outdoor dividers. The artificial azalea trellises give the option of bright, lifelike blooms in red, pink, or cream—all of which are outdoor-rated and UV-protected so that they won’t fade or lose their luster even in frost or extreme heat conditions. 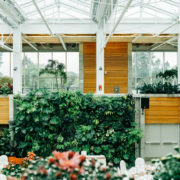 These movable trellises are the perfect way to block off spaces while maintaining partial visibility; as such, they are ideal for home patios and decks, restaurant patios, hotel pools and outdoor office break areas, and special events and trade shows. Our artificial boxwood hedges, available on their own or in commercial planters, are ideal for adding greenery to a space while creating privacy and blocking views at the same time. 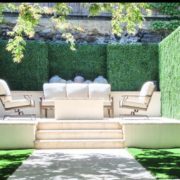 These lush hedges provide a fully restricted view that is perfect for adding around a private patio, pool, or changing area for full coverage. 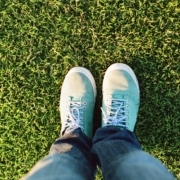 And since these outdoor artificial plants are UV-protected, they will stand up to even the most severe weather conditions without losing their color or manicured shape. 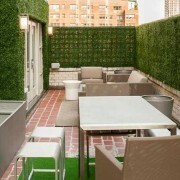 Use these verdant hedges to line a balcony or patio when neighbors are a bit too close for comfort, or to create a warm, conversational dining space on a restaurant patio. 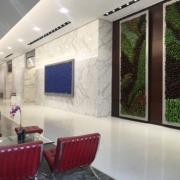 And since these outdoor-rated hedges are available in various sizes and can be customized to fit your space and privacy needs, they can be used anywhere, from homes and offices to shopping malls and hotels. Add a touch of privacy while maintaining partial views on your patio, balcony, or roof deck. 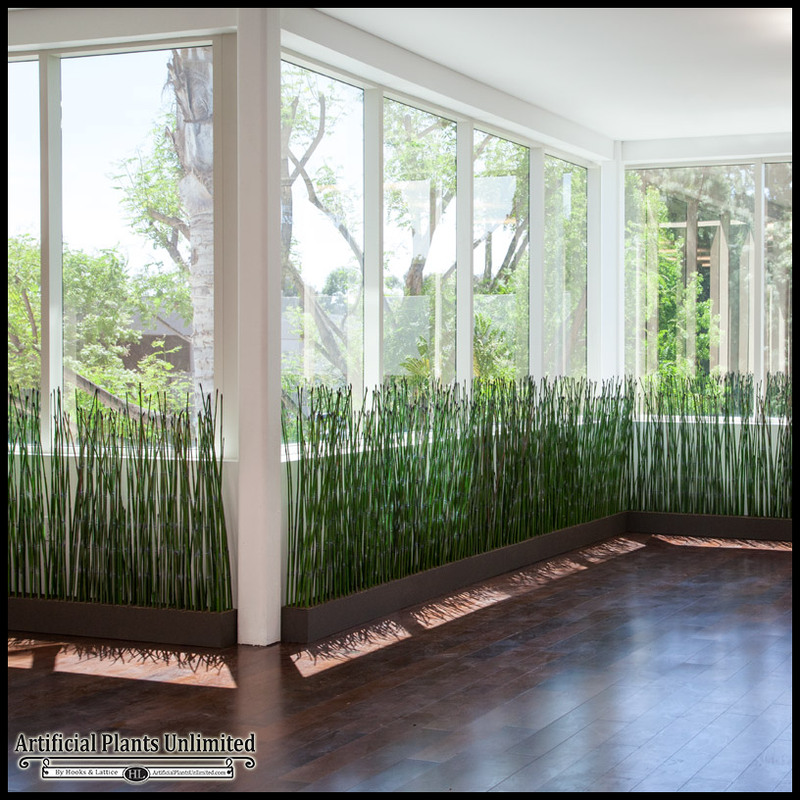 Our realistically designed horsetail reeds provide a pleasant visual barrier in a chic, modern design. These Equisetum reeds provide multiple functions, including directing foot traffic, cordoning off areas, lining walkways, and adding a natural-looking, no-maintenance design element. The reed themselves are carefully constructed so that they look like natural reeds, and yet they are made from an industrial-steel construction that allows them to maintain their beauty both indoors and out. Available in a variety of heights, ranging from 3 to 8 ft., our horsetail reeds can be purchased on their own or pre-placed in one of our modern outdoor planters. Choose the density you prefer, from standard to high density, to control how much privacy you wish to create. 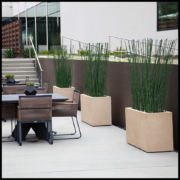 These chic reeds can be used in a variety of landscapes, including adding them to narrow walkways in homes or offices, placing them as café barriers in space divider planters on restaurant patios, or using them as contemporary décor pieces in hotel lobbies.